Of course, the show is going to be on Disney's new streaming service. Well, I'm going to miss that one. Won't pay for another streaming service just to watch one show. If the reviews are good I might pick up the Blu-ray discs. Been kind of disappointed with Netflix, lately. Depending on the cost, we might switch out 1 month Netflix, 1 month Disney. We'll see how things are looking when the service starts. Eventually, all Disney programming will go to the Disney streaming service. All the Marvel movies and TV shows (including the Netflix Marvel), Star Wars movies and shows, everything. Eventually, it is going to be worth the small monthly fee. We cut the cord on cable last year and have a few subscription services like Netflix, etc. Another $10 a month for Disney won't kill us. I'm not super excited about this show, but we'll give it a shot. I think I'll just wait for the discs to come out. We had to do that for Rebels season 4. My son just got it for his birthday and we are slowly moving through it. Being live-action, the show is unprecedented. Canon policy be damned, it is a cold harsh reality that cartoons have a different sense of reality and things that work for cartoons just won't work for live-action. I have a higher standard for this show than any previous SW TV show. I'm trying not to get my hopes up and I am not expecting mini-films, but this show should be better than the cartoons. Plus that way, you know it was roundly panned by the time you get around to deciding if you want to buy the discs or just get them from the library! My experience with Ash Vs. The Evil Dead, leaves me optimistic. Yeah, my policy for TV shows is to wait for the BluRay discs since I don't watch television anymore. Plus, and if I read that article right, nothing of the scripts have been written yet, so all we have is speculation at this point. But what is this series supposed to be about? Is it a sort of Star Wars Western about a lone Mandalorian "gunslinger?" I hope there's something more compelling than that because I was never a big fan of Westerns. Plus, and if I read that article right, nothing of the scripts have been written yet, so all we have is speculation at this point. But what is this series supposed to be about? Is it a sort of Star Wars Western about a lone Mandalorian "gunslinger?" The show is already in production which means that there is at least one script written. But the info at the two official links I shared in the OP are most of what has been revealed about it at this point. The character shown looks cool, like the Fetts always did. Same here. Not paying the Mouse for streaming. Cool. Thanks for sharing these. Good old wretched hive of scum and villainy. And we can see some Imperial activity after Jakku. That first video you shared has already been taken down. 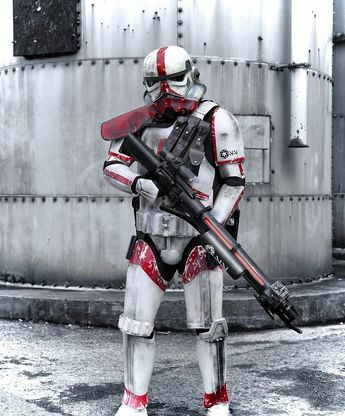 The Imperial flametrooper seems based on this, which I think is from a video game.